I received a custom request for a hand knit scarf and convertible fingerless gloves/mittens set from a woman who wanted to give a special send off gift to her boss who was relocating to the D.C. area. 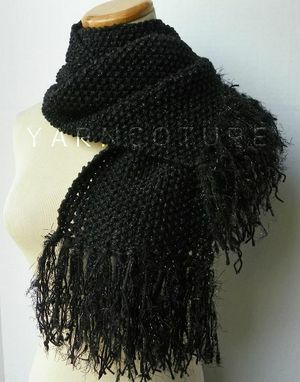 Her boss was a lover of silver and sparkly fabrics so I chose a soft knit yarn with metallic black fibers throughout with a splash of bamboo silk and extra flair on the ends of the scarf. 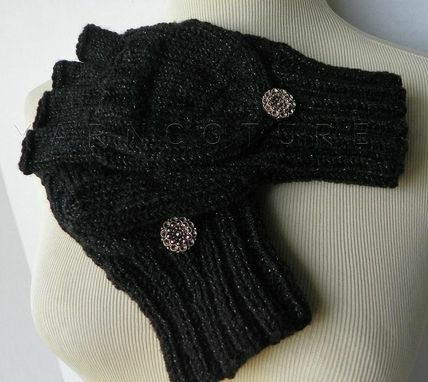 I also chose faux marcasite buttons for the closures to the mitten top portion of the convertible gloves. The results came out beautifully as the set could be worn for everyday as well as special occasions.